This update is for… drum roll please… the inspection pod. Despite all the trouble this one ultimately caused, I am pleased with how it finally turned out. But I want to be perfectly clear about something here. This schematic is not 100% accurate. Actually it is about 80% accurate, far less then what I usually prefer. The shape is correct and most of the major details are where they should be but a large part of the ventral surface is an educated guess. When I first started my research I was surprised at the image void for this little vessel. Her screen time as a hero ship totaled just four brief appearances (with her longest in the pilot) but I wrongly assumed her unique look would have generated better documentation. Thankfully Doug Drexler posted some clear renders on his blog. Unfortunately those images are not the final models used in the show and missing key details. (I may be wrong but I think it might be a digital “sketch” that the art department made before handing it off to Foundation Imaging.) The misplaced bits consist of a small pod found port and starboard aft, formation lights and main aft thruster details. Some of the hull details look different too. Screencaps from the show are of almost no use since they are either of the pod moving or at sharp angles. My only recourse was to cobble something together from those two sources, neither of which gave a clear view of her bottom. Be sure to see the full-size schematic listed on the E Deck Page of the TEP website. Anyway, hopefully this version will meet your approval. If it doesn’t… well… look over there! It’s a rabbit! If that doesn’t work, the title of this post is in Latin. Can anyone figure out what it says? And just for the record, I have two more to go so stay tuned. Thank you for all your great work. The pod looks fantastic, as do all your schematics. 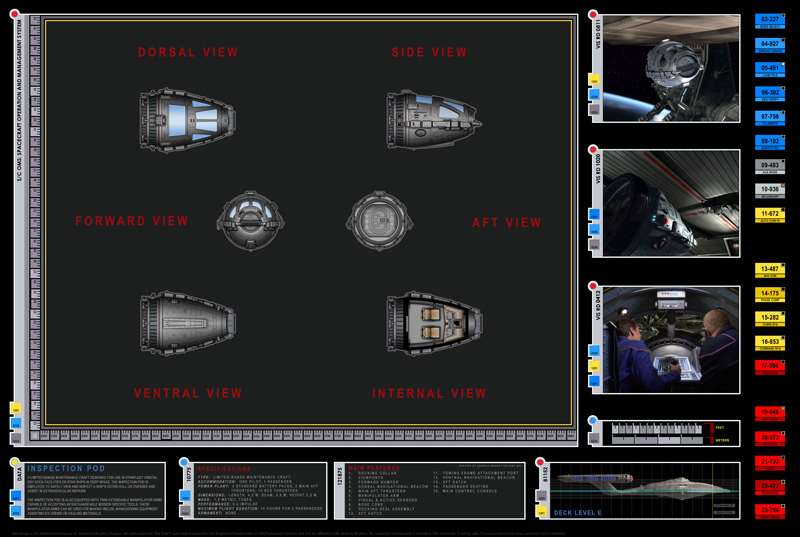 Can I just mention that the crew equipment page has at the bottom for the pad got the heading stun batton. Looking forward to the last to schematics. Keep up the good work. I will be damned. It does! Ooops. Thanks for the catch. It’s fixed now. Great work as always. Don’t worry about any inaccuracies as we know it’s not your fault.